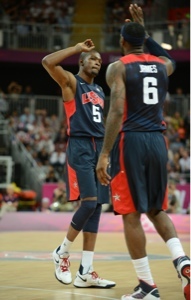 Team USA Two Wins Away from a Gold Medal ~ Roundball Manor - The House that Basketball Built. The Final Four teams will take the court today, with Spain first up against Russia, followed by the USA in a rematch from last week against Argentina. Winners will advance to the Gold Medal game, with the losers playing for bronze. The biggest suprise from this olympics has to be Russia. Not many predicted them to amake it this far, but with a revived Andrei Kirilenko leading the pack, and getting solid contributions from players like Timofey Mosgov and Alexey Shved, this team has only lost once during this tournament. Expect them to play a great game against Spain, who only put up a measly 66 points against France last game. 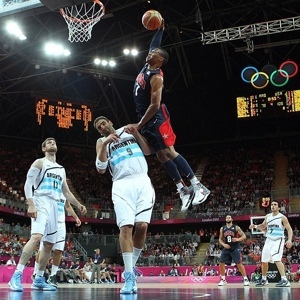 Don't be surprised if USA is playing the gold medal game against Russia. You have been forewarned. Team USA on the other hand played a solid game against Argentina last week, pulling away in the second half by dominating the third quarter in last week's game. Expect the Argentinians to put up a heck of a fight, and don't be surprised if it gets a little chippy at the end, as their continued 'sore loser streak' is sure to continue. USA should pull away at the end of this one as well. Medal Games are on Sunday afternoon. So get out your American Flags and expect the Newest Dream team to bring home another gold.